When discussing this with others, have they told you that it is due to the MSG (monosodium glutamate) in the food? If you have answered yes to any of these symptoms, you have suffered from Chinese Restaurant Syndrome. Is Chinese Restaurant Syndrome real and is MSG the cause of all these symptoms? Before, I further discuss Chinese Restaurant Syndrome, what is MSG and why is it so predominant is Chinese food? MSG, or monosodium glutamate, is the sodium salt of a glutamic acid and is generally used as a flavor enhancer, mostly used in Chinese food, canned and processed foods. 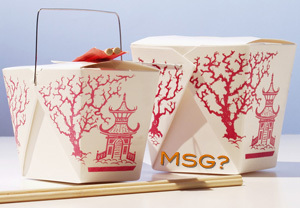 The FDA has declared that MSG is generally recognized as safe. However, because of the controversy surrounding MSG, the FDA still requires that food labels indicate the presence of MSG in the product. Despite the category the FDA has placed MSG under, why do so many people still negatively correlate MSG with feeling sick? It all started in 1968 (New England Journal of Medicine by Dr. Ho Man Kwok) , when the first report of reactions to Chinese food (symptoms would occur 15-20 min. after consumption) reports began to surface and as a result of those reports, the majority of people assumed that MSG was the culprit. From that point on MSG has gained a bad rep from the general public and the term "Chinese Restaurant Syndrome" has come about. It was assumed that MSG was unsafe but that was debunked by the FDA. Another assumption made by the general public is that MSG is artificially made in a lab, when in fact it occurs naturally in foods such as certain cheeses, tomatoes and mushrooms. The most common assumption is that MSG causes headaches for those who consume more amounts. There has been no scientific evidence that has proven the existence in the link between MSG and these symptoms. Several tests have been completed in which humans would consume many grams of MSG in their diet and negative consequences have not occurred. Scientists have agreed that other factors many contribute to those symptoms, rather than the MSG being the sole cause of these symptoms, and that some are more sensitive to MSG than others. The FDA has even gave the "ok" for a normal amount of consumption of MSG that would not result in these symptoms. I feel that Chinese Restaurant Syndrome is the result of a Placebo Effect on the general public. So many people go out to eat Chinese food either through take out or buffet and just overwhelm themselves with food. With the 1968 report, the public can justify these symptoms as part of a real sickness that occurs when consuming Chinese food. Once people are told that these symptoms will occur after consumption, they feel like it really is happening to them. In other words, people who are afraid of MSG are prone to the symptoms that they were told about or heard from others. As famous food critic Jeffrey Steingarten said, "If MSG is bad for you, why doesn't everyone in China have a headache?" This question, in turn, disproves the myth of MSG as the leading cause of Chinese Food Syndrome. Since MSG is used so widely in Asia, why don't they suffer from those symptoms listed above? I find it kind of funny that I ate Chinese food before reading this. I never even heard of this syndrome until now. In my experience with Chinese food, I never had a problem with it. Maybe people in China have a high tolerance for MSG. Or, maybe they don't use as much MSG as most people think they do; I don't know. However, I think people who react negatively to Chinese food are simply eating too much of it; like the saying goes: "Too much is just as bad as not enough." Interesting article though; I liked it.